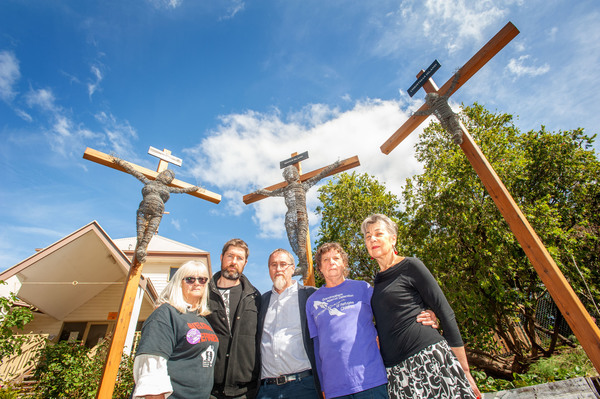 A confronting art installation that draws parallels between Christ’s crucifixion and the treatment of asylum seekers in Australia has been erected at the front of the Tecoma Uniting Church. The work depicts a father, a pregnant mother and child each hanging from their own crucifix and labelled with the sites of Australia’s most controversial detention centres: Manus Island, Nauru and Christmas Island. 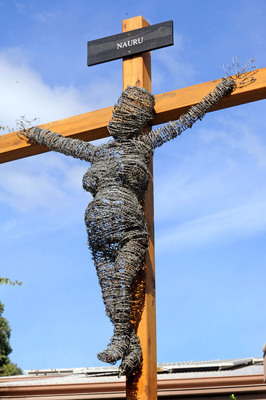 The four metre tall sculptures were created by Kallista resident and artist Reverend John Tansey who used 800 metres of barbed wire to create the art installation. 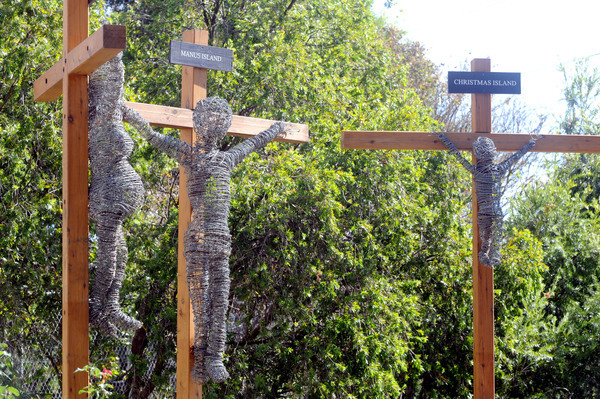 Reverend Tansey – who works in a mental health chaplaincy role – named his piece “Deterrence,” and said the art reflects the crucifixion of the human rights of asylum seekers. “Since time began, governments have used terror, torture, and fear to reinforce their authority, and power over vulnerable people,” Reverend Tansey said. 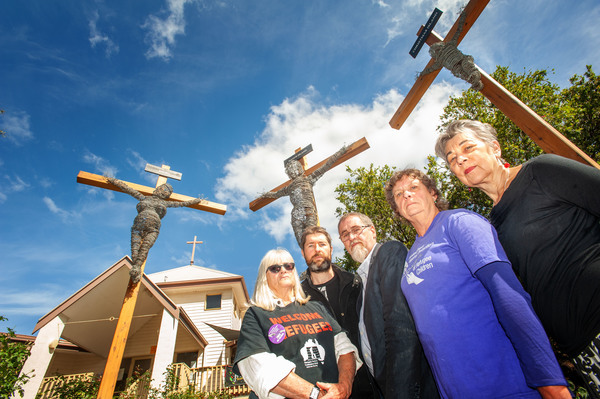 Rev Tansey said the work also reflects the way the cross was used in the past as a tool for fear and intimidation, and how the Australian government continues to use and abuse asylum seekers for political purposes. Matt Cutler, Minster at Tecoma Uniting Church said he hoped the work would provoke people to look at the Easter story in a new way and reconsider the ethics of detention centres. “We don’t see ourselves as the moral guide or the experts on any issue but see ourselves as being a voice on issues, by starting a conversation,” Mr Cutler said. He said that since the installation of the sculpture one week ago, there has been an overwhelming majority of support for it, though conceded that for many it might cause conflict. 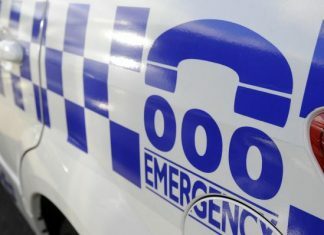 “The amount of positive feedback we’ve had has been really significant, which means it’s hitting a nerve for people in the community and shows this is something that’s important for people,” he said.